This is an excerpt from Securing Open Source Libraries, by Guy Podjarny. See the full report here. Open source software—the code of which is publicly available to scrutinize and typically free to use—is awesome. As consumers, it spares us the need to reinvent the wheel, letting us focus on our core functionality and dramatically boosting our productivity. As authors, it lets us share our work, gaining community love, building up a reputation, and at times having an actual impact on the way software works. Because it’s so amazing, open source usage has skyrocketed. Practically every organization out there, from mom-and-pop shops to banks and governments, relies on open source to operate their technical stacks—and their businesses. Tools and best practices have evolved to make such consumption increasingly easier, pulling down vast amounts of functionality with a single code or terminal line. Unfortunately, using open source also carries substantial risks. We’re relying on this crowdsourced code, written by strangers, to operate mission-critical systems. More often than not, we do so with little or no scrutiny, barely aware of what we’re using and completely blind to its pedigree. Every library you use carries multiple potential pitfalls. Does the library have software vulnerabilities that an attacker can exploit? Does it use a viral license that puts our intellectual property at risk? Did a malicious contributor hide malware amidst the good code? Unlike commercial software, Free Open Source Software (FOSS) rarely offers any guarantees or warranties. As a consumer of open source software, it is your responsibility to understand and mitigate these risks. This risk materialized in full force with the Equifax data breach announced in September 2017. The hack, which exposed extremely personal information of 143 million individuals, was possible due to a severe vulnerability in the open source Apache Struts library. This vulnerability was disclosed in March 2017, the Equifax system in question was not patched until late July, only after the breach was discovered. Equifax was fully capable of identifying and fixing this issue earlier, preventing the massive leak, and many claim not doing so is negligence on the company’s part. The Equifax breach is certain to become a poster child for the importance of securing data and using open source responsibly. This book will help you address the risk of vulnerable open source libraries, the very thing that tripped up Equifax. As I’ll discuss throughout this book, such vulnerable dependencies are the most likely to be exploited by attackers, and you’ll need good practices and tools to protect your applications at scale. Because the responsibility for securing applications and their libraries is shared between development (including DevOps) and application security, this book is aimed at architects and practitioners in both of these departments. With that in mind, the next few sections further explain what is in and out of scope for this book. The remaining topics will hopefully be covered in a broader future book. Open source projects come in many shapes and forms. One somewhat oversimplified way to categorize them is to divide them into tools and libraries. Tools are standalone entities, which can be used or run without writing an application of your own. Tools can be big or small, ranging from tiny Linux utilities, such as cat and cURL, to full and complex platforms such as CloudFoundry or Hadoop. Libraries hold functionality meant to be consumed inside an application. Examples include Node.js’s Express web server, Java’s OkHttp HTTP client, or the native OpenSSL TLS library. Like projects, libraries vary greatly in size, complexity, and breadth of use. This book focuses exclusively on libraries. While some open source projects can be consumed as both a tool and a library, this book only considers the library aspect. Open source software (OSS) projects can be downloaded directly from their website or GitHub repository, but are primarily consumed through registries, which hold packaged and versioned project snapshots. One class of registries holds operating system dependencies. For instance, Debian and Ubuntu systems use the apt registry to download utilities, Fedora and RedHat users leverage yum, and many Mac users use HomeBrew to install tools on their machines. These are often referred to as server dependencies, and updating them is typically called "patching your servers". Securing server dependencies primarily boils down to updating your dependencies by running commands such as apt-get upgrade frequently. While real-world problems are never quite this simple, securing server dependencies is far better understood than securing application dependencies. Therefore, while much of its logic applies to libraries of all types, this book focuses exclusively on application dependencies. To learn more about securing your servers, including their dependencies, check out Lee Brotherston and Amanda Berlin’s Defensive Security Handbook (O’Reilly, 2017). There are multiple types of risks associated with consuming open source libraries, ranging from legal concerns with library license, through reliability concern in stale or poorly managed projects, to libraries with malicious or compromised contributors. However, in my opinion, the most immediate security risk lies in known vulnerabilities in open source libraries. As I’ll explain in the next chapter, these known vulnerabilities are the easiest path for attackers to exploit, and are poorly understood and handled by most organizations. This book focuses on continuously finding, fixing, and preventing known vulnerabilities in open source libraries. Its aim is to help you understand this risk and the steps you need to take to combat it. Tools that help address vulnerable libraries are often referred to as Software Composition Analysis (SCA) tools. This acronym doesn’t represent the entire spectrum of risk (notably, it does not capture the remediation that follows the analysis), but as it’s the term used by analysts, I will use it throughout this book. Because the tooling landscape is evolving rapidly, I will mostly avoid referencing the capabilities of specific tools, except when the tool is tightly tied to the capability in question. When naming tools, I’ll focus on ones that are either free or freemium, allowing you to vet them before use. Chapter 6 takes a higher level perspective to evaluating tools, offering a more opinionated view of which aspects matter most when choosing the solution. Known Vulnerabilities in Open Source Packages defines and discusses known vulnerabilities and why it’s important to keep abreast of them. Chapters 2 through 5 explain the four logical steps in addressing known vulnerabilities in open source libraries: finding vulnerabilities, fixing them, preventing the addition of new vulnerable libraries, and responding to newly disclosed vulnerabilities. Chapter 6, as mentioned earlier, advances from explaining the differences between SCA tools to highlighting what I believe to be the most important attributes to focus on. Finally, Chapter 7 summarizes what we’ve learned, and briefly touches on topics that were not covered at length. This book assumes that you are already familiar with the basics of using open source registries such as npm, Maven, or RubyGems. If you’re not, it’s worth reading up on one or two such ecosystems before starting on this book, to make the most of it. A "known vulnerability" sounds like a pretty self-explanatory term. As its name implies, it is a security flaw that is publicly reported. However, due to the number and importance of these flaws, a full ecosystem evolved around this type of risk, including widely used standards and both commercial and governmental players. This chapter attempts to better define what a known vulnerability is, and explain the key industry terms you need to understand as you establish your approach for addressing them. Known vulnerabilities only apply to reusable products with multiple deployments, also referred to as third-party components. These products could be software or hardware, free or commercial, but they always have multiple instances deployed. If a vulnerability exists only within one system, there’s no value in inventorying it and making other people aware of it (except, perhaps, among attackers). Therefore, when we speak of known vulnerabilities we’re only referring to reusable products. Because most known vulnerabilities deal with commercial products (the world of open source known vulnerabilities is a bit more nascent), the entity in charge of the product is often referred to as a vendor. In this book, because it deals with open source packages and not commercial software, I’ll refer to that entity as the owner or author of the package. At the most basic level, a vulnerability is deemed known as soon as it’s publicly posted in a reasonably easy to find location. Once a vulnerability is broadly disclosed, defenders can learn about it and protect their applications, but attackers—including automated or less sophisticated ones—also get the opportunity to easily find and exploit it. That said, the internet is a big place, and holds a lot of software. New vulnerabilities are disclosed regularly, sometimes dozens in a single day. For defenders to be able to keep up, these vulnerabilities need to be stored in a central and easy to find location. For that purpose, quite a few structured databases, both commercial and open, have been created to compile these vulnerabilities and information about them, allowing individuals and tools to query test their systems against the vulnerabilities they hold. In addition, there are several databases that focus on vulnerabilities in open source packages, such as Snyk’s DB, the Node Security Project, Rubysec, and Victims DB. However, before digging into those, let’s review the broader and more standardized foundations of the known vulnerability database world: CVE, CWE, CPE, and CVSS. Vulnerabilities can also be known to certain parties but not be publicly posted. For instance, bad actors often find vulnerabilities in popular libraries and sell them on the black market (often called the "dark web"). These vulnerabilities are often referred to as zero-day vulnerabilities, implying zero days have passed since its disclosure. The most well-known body of vulnerability information is Common Vulnerability and Exposures (CVE). CVE is a free dictionary of vulnerabilities, created and sponsored by the US government, maintained by the MITRE non-profit organization. While backed by the US government, CVEs are used globally as a classification system. When a new vulnerability is disclosed, it can be reported to MITRE (or one of the other CVE Numbering Authorities), which can confirm the issue is real and assign it a CVE number. From that point on, the CVE number can be used as a cross-system identifier of the this flaw, allowing for easy correlation between security tools. In fact, most vulnerability databases will hold and share the CVE even when maintaining their own ID for the given vulnerability. It’s important to note that CVE is not itself a database, but rather a dictionary of IDs. To help automated systems access all CVEs, the US government also backs the National Vulnerability Database (NVD). NVD is a database, and exposes the vulnerability information through the standardized Security Content Automation Protocol (SCAP). CVE is a pretty messy list of vulnerabilities, as it applies to systems of an extremely wide variety. To help keep it consistent and usable for its consumers, MITRE established various guidelines and policies around content and classification. The three most noteworthy ones, at least for the world of OSS libraries, are CPE, CWE, and CVSS. In addition to the vast number of vulnerabilities they represent, CVEs also indicate flaws in extremely different products. In an attempt to make it easier for you to discover if a given CVE applies to your products, NVD can amend each CVE with one or more Common Product Enumeration (CPE) fields. A CPE is a relatively lax data structure that describes the product name and version ranges (and perhaps other data) this CVE applies to. Note that CPEs are not a part of CVE, but rather a part of NVD. This means a known vulnerability will not have product info unless it makes it to NVD, which doesn’t always happen (more on that later on). CPEs are a powerful idea, and can enable great automated discovery of vulnerabilities. However, defining a product in a generic way is extremely hard, and the content quality of many CVEs is lacking. As a result, in practice CPEs are very often inaccurate, partial, or simply not automation-friendly enough to be practical. Products that rely heavily on CPEs, such as the OWASP Dependency Checker, need to use fuzzy logic to understand CPEs and fail when content is lacking, leading to a large number of false positives and false negatives. To address this gap, most commercial vulnerability scanners and databases in the OSS libraries space only use CPEs as a starting point, but maintain their own mappings of a CVE to the related products. While every vulnerability is its own unique snowflake, at the end of the day most vulnerabilities fall into a much more finite list of vulnerability types. MITRE classifies those types into the Common Weakness Enumeration (CWE) list, and provides information about each weakness type. While CWE items can get pretty specific (e.g., CWE-608 represents use of a non-private field in Struts’ ActionForm class), its broader categories are more widely used. For instance, CWE-285 describes Improper Authorization, and CWE-20 represents the many variants of Improper Input Validation. CWEs are also hierarchal, allowing a broader scope CWE to contain multiple narrower scope ones. The smaller number of CWEs makes it more feasible to provide rich detail and remediation advice for each item, or define policies based on a vulnerability type. Each CVE is classified with one or more CWEs, helping its consumers focus on the CWEs they’re most interested in and removing the need to repeat CWE-level information for each associated CVE. Vulnerabilities are disclosed on a regular basis, and at a rather alarming pace, but not all of them require dropping everything and taking action. For instance, leaking information to an attacker is not as bad as allowing them to remotely execute commands on a server. In addition, if a vulnerability can be exploited with a simple HTTP request, it’s more urgent to fix than one requiring an attacker to modify backend files. That said, classifying vulnerabilities isn’t easy, as there are many parameters and it’s hard to judge the weight each one should get. Is access to the DB more or less severe than remote command execution? If this execution is done as a low-privileged user, by how much should that reduce its severity score compared to an exploit performed as root? And how to judge an exploit requiring a long sequence of requests, but that can be accomplished with a tool downloaded from the web? On top of all of those, the severity of an issue also depends on the system on which it exists. For example, an information disclosure vulnerability is more severe on a bank’s website than it is on a static news site, and a vulnerability that requires physical machine access matters more to an appliance than to a cloud service. Immutable details about a vulnerability, including the attack vector, exploit complexity, and impact it could have. Time-sensitive information, like the maturity of exploit tools out there or ease of remediation. Context information for the vulnerable system, such as how sensitive it is or how is it accessible. Figure 1-1 shows the variables and calculation of a CVSSv3 score for a sample vulnerability (the calculation was generated using FIRST.org’s online tool). While all three scores matter, public databases typically show CVSS scores based only on the Base component. 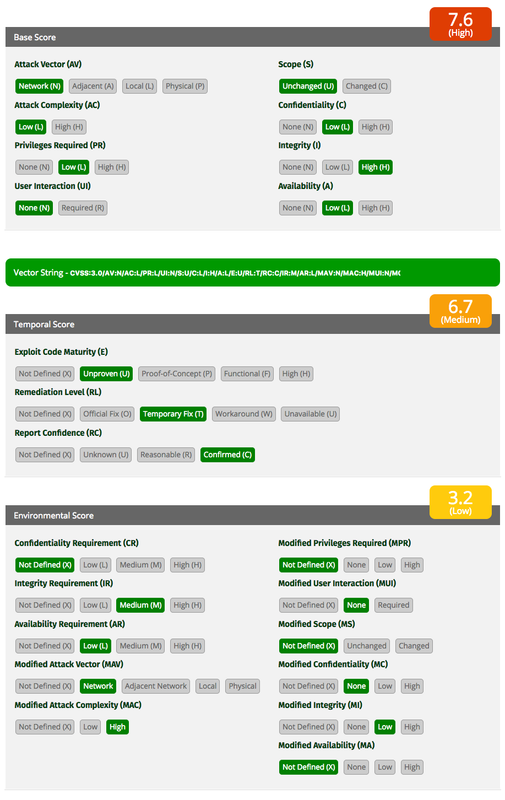 The constant change in the Temporal score makes it costly to maintain, and the Environmental score is, by definition, specific to each vulnerability instance. Still, users of these databases can fill in those two scores, adjust the weights as they see fit, and get a final score. Having a CVE is helpful, but it’s also a hassle. Receiving a CVE number requires the author or reporter to know about it in the first place, and then go through a certain amount of paperwork and filing effort. Finally, CVEs need to be approved by specific CVE Numbering Authorities (CNA), which takes time. As a result, while CVEs are the norm for vulnerabilities in certain types of systems (e.g., network appliances), they’re not that common in other worlds. 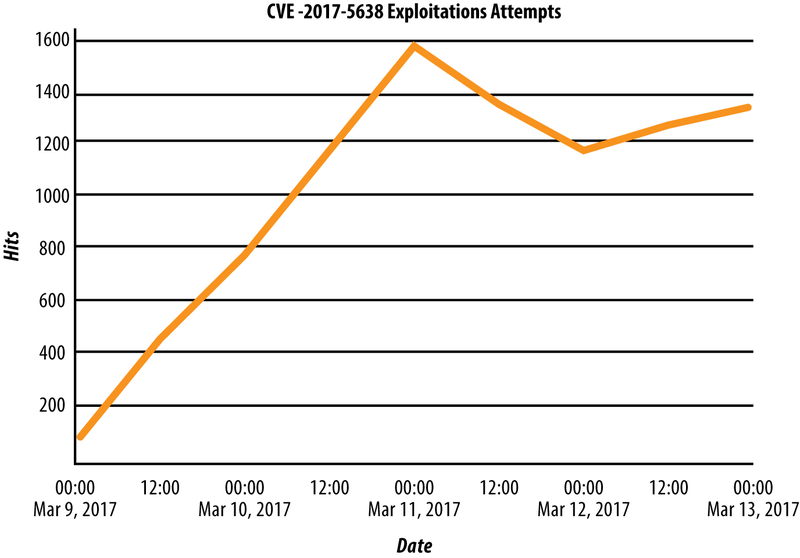 CVEs are in especially bad shape when it comes to known vulnerabilities in OSS packages. Based on a Snyk’s database as of October, 2017, only 67% of Ruby gem vulnerabilities have a CVE assigned, and a meager 11% of npm package vulnerabilities have such an ID. One reason for this gap is the fact many library vulnerabilities are reported by developers, not security researchers, and communicated as bugs. Such issues are often fixed quickly, but once fixed the author and reporter rarely go through the CVE process. Even when they do, the assignment of the CVE lags far behind, while attackers may be exploiting the vulnerability now made known. Yet another lag takes place between the assignment of a CVE and posting it to NVD, providing more detail and perhaps CPEs. Such delays are expected when a new vulnerability reserves a number while it’s going through a responsible disclosure process, but the lag often happens after the vulnerability is known. This lag is very evident when looking at vulnerable Maven packages: 37% of Maven package vulnerabilities that have a CVE were public before being added to NVD, and 20% of those were public for 40 weeks or more before being added. Known vulnerabilities that are not on NVD are still known, but harder to detect. Library vulnerabilities are likely to either have no CVE, not be listed on NVD (and thus have no advisory or CPE), or have poor-quality CPEs. Each of those would prevent their detection by tools that rely exclusively on these public data sources, notably OWASP Dependency Checker. While CVE, CWE, and CVSS are all MITRE standards, they can be used independently of one another. CWE and CVSS are often used for vulnerabilities that have no CVE, offering standardized classification and severity even if there is no industry-wide ID. Every known vulnerability was at some point unknown. This may seem obvious, but it’s an important point to understand—a new known vulnerability is not a new vulnerability but rather a newly disclosed one. The vulnerability itself was already there before it was discovered and reported. However, while disclosing a vulnerability doesn’t create it, it does change how it should be handled, and how urgently it should be fixed. For attackers, finding and exploiting an unknown vulnerability is hard. There are endless potential attack variants, which need to be invoked quickly while avoiding detection. Determining if an attack succeeded isn’t always easy either, implying a submitted payload might have successfully gone through while the attacker remains none the wiser. Once a vulnerability is disclosed, exploiting it becomes far easier. The attacker has the full detail of the vulnerability and how it can be invoked, and only needs to identify the running software (a process called fingerprinting) and get the malicious payload to it. This process is made even easier through automated exploit tools, which enumerate known vulnerabilities and their exploits. This automation also lowers the barrier to entry, allowing less sophisticated attackers to attempt penetration. Known vulnerabilities are largely considered to be the primary cause for successful exploits in the wild. To quote two sample sources, Verizon stated "Most attacks exploit known vulnerabilities that have never been patched despite patches being available for months, or even years", and Symantec predicts that "Through 2020, 99% of vulnerabilities exploited will continue to be ones known by security and IT professionals for at least one year". On the application side, analyst firms such as Gartner and RedMonk have repeatedly stated the critical importance of dealing with known vulnerabilities in your open source libraries. Known vulnerabilities should therefore be handled urgently. Even though it’s the same vulnerability, its disclosure makes it much more likely attackers would use it to access your system. The disclosure of a vulnerability triggers a race, seeing whether a defender can seal the hole before an attacker can go through it. Figure 1-2 shows attackers response to the disclosure of the severe Struts2 vulnerability mentioned earlier, ramping from zero attacks to over a thousand observed attacks per day in a couple of days. The good news is that known vulnerabilities are also easier to defend against than unknown ones. Typically a known vulnerability also has a known solution, often in the form of a software upgrade or patch. Even if no software solution exists, you should at least have a better understanding of how to detect attacks and keep them from getting through with your security controls. As I’ll discuss in Chapter 5, it’s important to invest in systems that let you learn about such disclosures quickly and to act on them faster than the bad actors will. So far I talked about a disclosure as a single point in time, when in fact it shouldn’t be so binary. The right way to disclose a vulnerability, dubbed responsible disclosure, involves several steps that aim to give defenders a head start in the mentioned race. Understanding responsible disclosure is not critical for open source consumers, but it is very important for open source authors. To learn more about responsible disclosure, you can read Tim Kadlec’s excellent blog post, or look at Snyk’s responsible disclosure template. Known vulnerabilities are not as simple as they initially appear. The definition of what’s considered known and the management of the vulnerability metadata are very hard to do well. CVE and NVD work well for curating vulnerabilities in commercial products, but do not scale to the volume and ownership model of open source projects. Over time, these standards may evolve to meet this demand, but right now their coverage and detail level are not enough to protect your libraries. Article image: Footbridge (source: StockSnap). Guy Podjarny is a cofounder at Snyk.io focusing on the security risk in your dependencies. Guy was previously CTO at Akamai and founder of Blaze.io. Guy is a frequent conference speaker, the author of Responsive & Fast (O’Reilly Media), and the creator of Mobitest. He also writes on guypo.com and Medium.